Vanderbilt University Medical Center recently performed its first pediatric dual heart/kidney transplant on a 13-year-old girl from Chattanooga. According to United Network for Organ Sharing (UNOS) data, there have been just 37 heart/kidney transplants in children younger than 18 performed in the United States since 1998. Ahmya Calloway had end-stage renal failure that impacted her heart function. She received her lifesaving heart transplant on May 2, and early on May 3 surgeons implanted her kidney. Ahmya’s mother, Darnima Calloway, said the journey to transplant has been a long one. The back-to-back surgeries came nearly one year after she was listed for both organs and five years after she began dialysis. “She has been followed by Dr. Jabs (Kathy Jabs, M.D., associate professor of Pediatrics at Monroe Carell Jr. Children’s Hospital at Vanderbilt) since she was about 2 years old,” Calloway said. “Medication was the first thing they tried, but over time things declined to the point that she needed dialysis. We started on hemodialysis until we could begin the peritoneal dialysis from home. But after a year, she had to return to hemodialysis. The arduous dialysis schedule left Ahmya with little time for anything else. She spent more than half of her time at Vanderbilt. In early 2016 she was admitted to await transplantation after a series of concerning heart rhythms. “Her heart function had deteriorated to a point that it was no longer safe for her to be at home,” Jabs said. “It is very rare for children to receive a simultaneous heart and kidney transplant. Ahmya was discharged in early June and will remain in the Nashville area for an additional six weeks before heading back home, just in time for the start of school. “My biggest hopes for her are that her organs stay healthy and she will be able to enjoy a normal life,” her mother said. “She has not been able to do things she wants. Driving here three times a week had major limitations on her ability to do anything. She has not been able to attend school since the third grade. Bret Mettler, M.D., assistant professor of Cardiac Surgery at Children’s Hospital and Ahmya’s heart transplant surgeon, could not be happier for his patient. “The most remarkable thing about this case is that we took a child with multi-system organ dysfunctions requiring dialysis multiple times a week, and within a 24-hour period, we have given her a new heart and, more importantly, given her a new kidney,” Mettler said. “She no longer has to have dialysis. Removing the dialysis component improves her quality of life exponentially. “As a cardiac surgeon, a heart transplant is the greatest gift,” he said. “In Ahmya’s case, I hope her heart serves her well for many years, but her kidney transplant has made the most immediate impact on her quality of life, and likewise for her family. Helping Ahmya helped her entire family. That’s amazing and something our entire team is honored to be a part of. The outlook for Amhya is good, her doctors said. She will continue to be followed on a regular basis at Vanderbilt. There have been 10 adult combined heart/kidney transplants performed at Vanderbilt since 2011. This newest milestone highlights the medical and surgical expertise available at Children’s Hospital, said Douglas Hanto, M.D., Ph.D., director of the Vanderbilt Transplant Center. 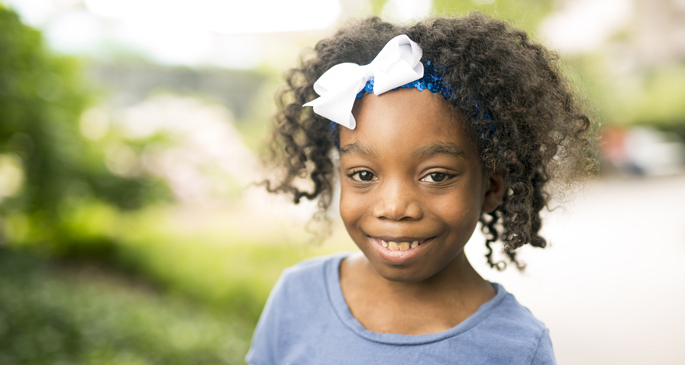 Ahmya’s mom is thankful that Vanderbilt was able to restore her daughter’s health.